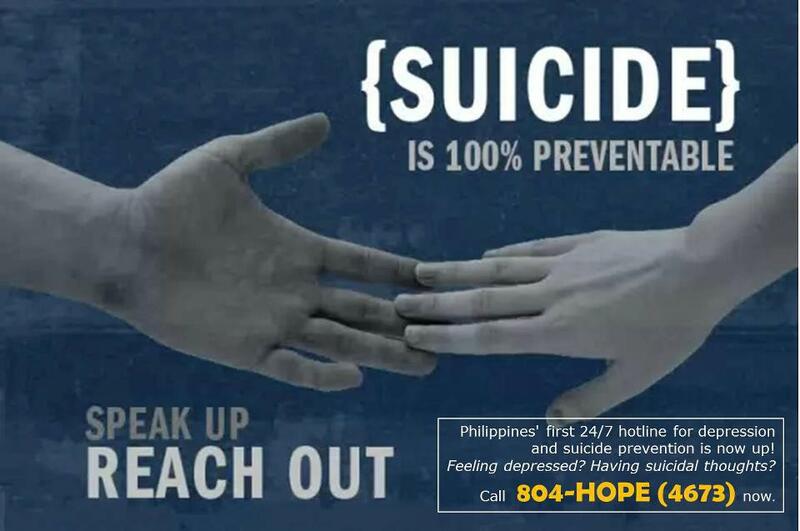 The first ever 24/7 hotline for depression and suicide prevention is now available in the Philippines. You can call (+632) 804 – HOPE (4673), 0917 558 HOPE (4673), and 2919 (a toll free number for all GLOBE and TM subscribers) if you need help dealing with depression and suicidal thoughts. It was timely that I stumbled upon this info over Facebook because an old college friend had been messaging me about her personal issues lately. I’ve always known this person to be optimistic and jolly amidst problems and I trust that her fortitude will prevent anything similar to Kristel Tejada’s demise. Tejada is a recent talk of the town following her suicide supposedly due to tuition problems. She owed U.P. Manila about Php 10,000 worth of unpaid school loan and was forced to take a leave of absence after she failed to pay the fees. Although it wasn’t the first time that Tejada was unable to pay, I believe that it isn’t right for any school system to compel students to go on an LOA for failure to pay fees. It is even a government school at that and not to mention that there was supposedly a tuition fee bracketing system depending on the income of each student’s families. Tejada should have been under the free tuition category considering the fact that her mother is unemployed, her father is a part-time taxi driver, and they were five siblings altogether. But none of these matters now as the 16 years old freshman Behavioral Science student was laid to rest yesterday after a week when she killed herself. What’s sad is that there is still a way out of her situation. She wasn’t the only one to suffer from the flaws of our educational system, from poverty, and other issues in life. All these are bearable if there was enough guidance or if she had at least someone, anyone to talk to so she can find hope and eventually a resolution to her problems. So if there’s anyone out there facing dilemmas seemingly beyond what you can resolve, the hotline numbers above are available to call when in the Philippines. For more information, visit the Natasha Goulbourn Foundation or NGF online via www.ngf-hope.org. NGF by the way was founded by Jean Goulbourn in memory of her daughter, whom she lost in 2002 due to suicide. NGF started in 2007 and aims to educate everyone about depression and its worst case scenario potential effect – suicide. Depression isn’t a mental illness but it affects a person’s mental well being. When you’re depressed (mental), everything is affected including emotional, physical, and social. You get emotionally affected easily, you tend to eat more or less, sleep late or sleep none at all, and you isolate yourself from everyone. It’s all in the mind most people say and you can battle being depressed with happy thoughts and actively doing something but that’s not always the case. Anti-depressants may seem to alleviate the symptoms but only to an extent and for a while. It’s not even ideal to periodically need these types of meds. Based on some studies, they can sometimes cause suicidal thoughts. There are things which are better than meds. Power words love, joy, and peace are the best. But they are not merely words, they are actions. All these are present in God, family, relatives, friends, and everyone else. You just need to realize that and take advantage of it. I know because I can relate. Depression and thoughts of suicide can happen to anyone suffering from all too many issues in life all at the same time. So if you see signs of depression evident with someone you know, reach out before it’s too late. I tried to chronicle my own ideas about depression in a blog last year in the hope of helping out. Too bad I wasn’t able to sustain posting on it regularly. But if you are dealing with anything beyond what you can bear, don’t keep it all within. Refer to the hotline for depression and suicide prevention numbers above once again and speak out. Hi, Marie.. I am feeling the same, maybe a bit worse because I think I have suicidal tendencies.. And i tried calling that number but no avail.. Maybe we can help each other out instead, you and me? Say..talking to each pther about things.. That may actually work, i think. Hey there! Hang on! Join this group or post on their Facebook page - https://www.facebook.com/groups/157436724413122/ . People are really helpful there. Are the hotlines still active? My friend needs help immediately. Can someone talk to him? I don't know. Do try calling the numbers though. If not, join the FB group I listed. They're very active but you may need verification before posting though. Why do they need to have a verification? That I don't get. I tried to join the group but what they are asking are way too personal. I don't know why. It's probably a screening process to make sure that people who join the group genuinely need help and are not tripping, if you get what I mean. Are those numbers for calls only? I tried sending an SMS but there was no reply. Does anybody know any number to send a message to for consultation/ counseling? Thanks. Hi my name is Mae. I have battled with depression for years but was never really diagnosed with major depressive disorder until July of 2016. I am now currently working with a psychiatrist since my diagnosis. I can finally sleep but I am still ocassionally sad and cry for no apparent reason. If there's anything I learned from counselling, it's the fact that depression is not my fault. I did not bring it upon my self. It's selfish, it feeds you lies, people are not better off without me. Please bear that in mind when you're having a particularly bad day. My doctor is awesome. My doctor is funny. He can make me laugh even with tears running down my face. My doctor is intelligent and takes his time explaining things to me that confused me for years. I can rave about him all day long. With his help I can finally say, for the first time in a long time, that I am going to get better. Give him a call, book an appointment. Trust me, a single visit can make a world of difference. Help. I just need someone to talk to. I've had relationships before but I've never felt this bad. Most of the months that we've been together I always hurt myself when we fight. I tried to slash my wrist but did not succeed so I lashed out a few times more instead just to make myself bleed even a little. I hit myself with either my fist or anything that i get my hands into like an award made of thick wood slab one time. If I don't hurt myself, my thoughts of drinkng poison gets more intimate with my brain. I just wanna die. I envy dead people. Atleast they have peace. Hi 'ive been depressed for months, always thinking of killing myself. For months, I've been asking God to put an end to my life as I see myself a nuisance and useless. That I would only aggravate my family, the people around me in general. That I would rather barter my life to some one who deserve better, someone who is more useful, who have more dreams, whose family wished him/ her longer life. I'm even planning to leave a will testament, to donate useful parts of my body to someone who needs it. I've been stressed with work, I keep on making mistakes, I hurt people. They only see me as an eyesore. It's not that i want to kill myself to put an end to my problems in life but to put an end to the problems I have caused to those people who are around me. There's always a reason to live. If you need help, just ask for help.